Astronomers from the Instituto de Astrofísica de Canarias (IAC) have produced a complex velocity analysis of the spiral galaxy NGC 3433 with surprisingly precise results. They compared observations using the 2D Fabry-Perot spectrometer GHaFaS on the William Herschel Telescope (WHT) with those of the same object taken with the IFU spectrograph MUSE on the Very Large Telescope (VLT) in Chile. Font and Beckman (IAC) have developed a technique (FB) for finding the corotation radii in galaxies, i.e. the radii at which the spiral density waves propagate at the same angular speed as the stars and the gas. 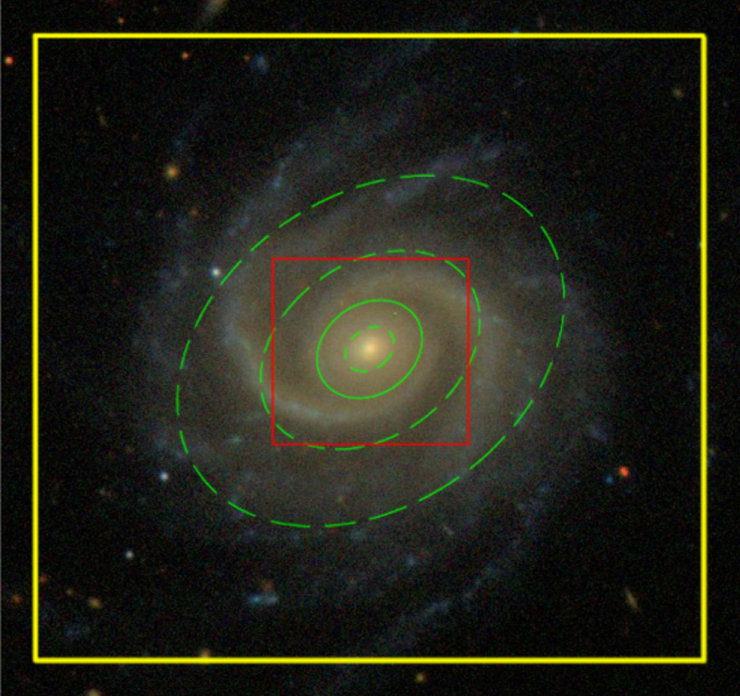 Simple theory suggests that the bar of a galaxy should stimulate a density wave outside it, which in turn stimulates and maintains the spiral arms. Using FB, the IAC researchers had shown previously in a large sample of galaxies that normally more than a single corotation is found in a galaxy, but that only one of them is related to the bar, while the others are found in the spiral arms, at increasing radii, or associated with a smaller, nuclear bar or oval distortion at small radii. While MUSE has a 1 arcmin × 1 arcmin field and offers spectral coverage of both stellar and gas components with a resolution of some 50 km/s in velocity, GHaFaS has a larger field of view, 3.4 arcmin × 3.4 arcmin field, gives a resolution in velocity of 6 km/sec, but it can observe only the ionised interstellar gas. Now with NGC 3433 they have put all of their previous work on a firmer basis by comparing it with a classical, and quite different, technique for finding corotation radii, developed by Tremaine and Weinberg (TW). They applied both methods to the velocity fields of both the stars and the insterstellar gas, using the observations of both GHaFaS and MUSE. They found four corotation radii. NGC 3433 (image from SDSS). Superposed: MUSE field (red square); GHaFaS field (yellow square); projected corotation circle for the bar (solid green line); and the other measured corotation radii (dashed green lines). Large format: [ JPEG ]. The innermost one, in the circumnuclear zone, could be detected only using FB, but was found clearly in both MUSE and GHaFaS data for the gas with a difference of 7% in the values. The second one, corresponding to the main bar, and the most intense, was measured in six different ways: using FB on the gas with GHaFaS, FB on the gas with MUSE, FB on the stars with MUSE, TW on the gas with GHaFaS, TW on the gas with MUSE, and TW on the stars with MUSE. The uncertainty in the corotation found by using all 6 values was only 4%. A third corotation was found using FB on gas for both GHaFaS and MUSE, and a fourth corotation, beyond the limits of the field of MUSE, was measured using FB and TW on the gas with GHaFaS. The values for the corotation radii in both cases, gave excellent agreement between the two methods used. Measured this way the corotation radii are among the most accurately determined parameters of the galaxy, compared with, for example, the bar length. Panel (a): velocity map of NGC 3433 using the first moment map of Hα emission in the FP data cube from GHaFaS. The box in black shows the size of the MUSE data. Panel (b): velocity map of Hα emission from the central square arcmin from the MUSE data cube. Panel (c): velocity map of the stellar component from the MUSE data. Large format: [ JPEG ]. Although this study deals with only a single galaxy, its results are powerful because they verify FB as a method, and it is considerably easier than TW to apply to large numbers of objects, demanding less observing time. Measuring the principal corotation radius allows us to measure the pattern speed of the bar, and this allows us to perform a whole range of tests on the evolution of galaxies, including measuring the braking effects of dark matter halos. "For the time being we are confined to low redshifts, but as our techniques advance we have hopes of reaching intermediate redshift objects in the fairly near future", said John Beckman. Beckman, John E.; Font, Joan; Borlaff, Alejandro; García-Lorenzo, Begoña, 2018, "Precision Determination of Corotation Radii in Galaxy Disks: Tremaine-Weinberg versus Font-Beckman for NGC 3433", ApJ, 854, 182 [ ADS ]. "The Galaxies "tune up their musical instruments", IAC press release, 9th April 2018. "New Light on Dark Matter Halos", ING web news release, 13th February 2017.